Naruto. . Wallpaper and background images in the Naruto club. does anyone realize gaara went thru worse? gaara had to go threw worse and his own uncle tryed to kill him by the orders of his dad .his uncle didnt even have to follow the orders he said so in the book vol.15. but i feel sad for naruto to. Yeah but unlike Gaara, Naruto had absolutely no family. Gaara shared some happy moments with his uncle but Naruto was always alone. Nobody loved him. I personally believe Naruto has been through more. 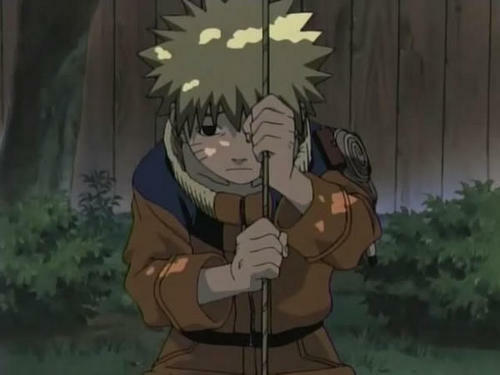 poor naruto.. i really dont like 2 c my fav character being alone and sad.. It's true that Gaara had his uncle but to learn that the one person you thought as your only true family hated you all along and wanted you dead enough to try and kill you, is worse than not having any family at all. Who would`ve knew...Naruto went to this... to the fastest ninja alive,the controller of the nine-tails,the hero of the leaf.Those people that are saying Gaara had it worse, your wrong.Think about it Naruto never knew what parental love was like, he never even knew what his parents looked like,their personality,how they died even who they were!!! Plus the village hated him,pushed him, called him a monster or even disgusting! Then when he finally found a friend he ran off into the darkness (sasuke). Then when he finally found what parental love is really like, (Jiraiya) that person died!!!! I can relate to Garra and Naruto so well. Naruto was so sad in that episode. Aww.......................................­...­...­...­...­...­...­...­...­...­...­...­...­...­...­...­...­...­...­...­...­...­...­...­...­...­...­...­...­...­...­...­...­...­...­...­...­...­...­...­...­...­...­...­...­...­...­...­...­...­...­...­...­...­...­...­...­...­...­...­...­...­...­...­...­...­...­...­...­...­...­...­...­...­...­...­...­...­...­...­...­...­...­...­...­...­...­...­...­...­...­...­...­...­...­...­...­...­...­...­...­...­...­...­...­...­...­...­...­...­...­...­...­...­...­...­...­...­...­...­...­...­...­...­...­...­...­...­...­...­...­...­...­...­...­...­...­...­...­...­...­...­...­...­...­...­...­...­...­...­...­...­...­...­...­...­...­...­...­...­...­...­...­...­...­...­...­...­...­...­...­...­...­...­...­...­...­...­...­...­...­...­...­...­...­...­...­...­...­...­...­...­...­...­...­...­...­...­...­...­...­...­...­...­...­...­...­...­...­...­...­...­...­...­...­...­...­...­...­...­...­...­...­...­...­...­.Ca­n i give him a huggy!?! That'll cheer him up, im sure!